Utilities, Pipeline Master Limited Partnerships and Real Estate Investment trusts typically distribute a large portion of their earnings and cash flows to their shareholders. As a result, most of them typically enjoy high dividend yields in comparison to the broader market. The main disadvantage is that dividend increases are not as high as those for other traditional dividend growth stocks such as PepsiCo (PEP) or Coca Cola (KO). Given the low interest rate environment over the past two years however, many investors have started chasing the high distributions from these sectors, which has lead to increases in stock prices and decrease in dividend yields to historic lows. This has led some market analysts to proclaim that we might be approaching a dividend bubble. In a previous article I noted that we are far from a dividend bubble at this point. Any further increase in popularity for high yielding stocks such as Utilities, Master Limited Partnerships and Real Estate Investment Trusts however could bring us closer to this point for these sectors, and would make other dividend growth sectors more appealing. Diageo plc (DEO) engages in producing, distilling, brewing, bottling, packaging, distributing, developing, and marketing spirits, beer, and wine products worldwide. This international dividend achiever has paid uninterrupted dividends on its common stock since 1988 and increased payments to common shareholders every year since 1998. Diageo’s largest competitors include Brown-Forman (BF-B), Constellation Brands (STZ) and SAB Miller (SBMRY). The company has managed to deliver a 5.50% annual increase in EPS since 2001. Analysts expect Diageo to earn $5.77 per share in 2012 and $6.44 per share in 2013. In comparison Diageo earned $4.84 /share in 2011. Diageo owns some of the best known brands in spirits, including Smirnoff, Johnnie Walker, Baileys, Guinness, Captain Morgan and Jose Cuervo. I have previously written how strong brands are good for dividend growth. Diageo has focused exclusively on organic growth in its premium brands, shedding non-core assets over the past decade, and also focusing on achieving sales growth through acquisition of other premium spirits names. Diageo has benefited from strong demand for its premium products worldwide, as evidenced by strong volume growth over the past few years. A particular bright spot is the company’s performance in emerging markets, which accounts for one third of its revenues. The company has maintained a high return on equity of over 30% for the majority of the decade. Rather than focus on absolute values for this indicator, I generally want to see at least a stable return on equity over time. The annual dividend payment in US Dollars has increased by 7.30% per year since 2001, which is higher than the growth in EPS. With international dividend achievers, it is important to look at the trend in distributions in their base currencies. Despite the fact that the annual dividend payment appears volatile in US dollars, the growth in distributions in UK pounds has shown a consistent upward trend in distributions. 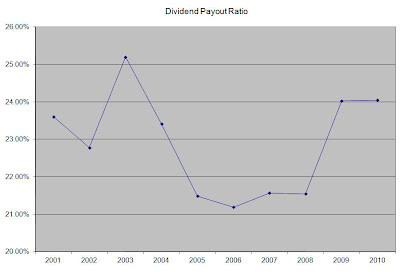 An 7% growth in distributions translates into the dividend payment doubling almost every ten years. The company pays dividends twice per year. The interim payment is typically almost 40% of the total annual amount and is paid in April. The Final payment is approximately 60% of the total dividend and is typically paid in October. 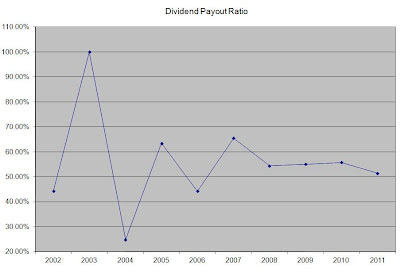 The dividend payout ratio has mostly remained above 50%. It is just a tad above 50% currently, which means that the distributions are sustainable. A lower payout is always a plus, since it leaves room for consistent dividend growth minimizing the impact of short-term fluctuations in earnings. Currently Diageo is attractively valued at 18.20 times earnings, has a sustainable dividend payout and yields 3%. My strategy relates to buying quality dividend stocks which fit my criteria, then sit back and hold on until one of these three events happens. However, there are other ways for investors to actively generate income from dividend paying stocks. Although they are mostly for sophisticated investors, everyone should be aware of them. One such strategy is active dividend investing. This relates to selling a stock when its current yield drops below a certain threshold. For example, back in 2009, investors could have purchased shares of Aflac (AFL) at $20 or less per share. As a result they would be earning a yield on cost of 6%. However, given the steep run up in the share price since then, the current yield is 2.80%. The question that some investors ask themselves is whether it makes sense to sell a company yielding 2.80% today, and substituting it for a company which has a higher current yield. After all, this would only increase the current income that the portfolio generates. For investors who are in the distribution phase of their dividend investing lifecycle, any boost in the dividend income could be seen as a nice bonus. I typically worry about replacing dividend stocks after I sell dividend stocks when one of these three events occur. The reason why I don’t sell stocks that have gone up so much, that their current yield is low, is because I would not want to miss out on any dividend growth potential. The main reason why I invest in stocks with growing dividends is the rising stream of passive income over time. The beauty of dividend growth stocks is that the increased dividends tend to lead to share price appreciation. While this process is not as linear as that of consistent dividend increases, total returns will increase your portfolio value, while also maintaining purchasing power of your principal. I believe that both McDonald’s (MCD) and Yum! Brands (YUM) have the potential to deliver strong total returns. However, given Yum! Brands strong position in China, I would expect them to slightly outperform the golden arches. Valuation is important as well. Right now McDonald’s (MCD) is trading at 20 times earnings, while Yum! Brands (YUM) is trading at 24.50 times earnings. Valuation also drives total returns over time. Overpaying for stocks could result in subpar performance. Since Yum! was spun off from PepsiCo (PEP) in 1997, it has handily outperformed Mcdonald’s (MCD). Over the past five years however, McDonald’s (MCD) was able to deliver stronger price gains in comparison to Yum!. Over the past five year, MCD has managed to increase dividends per share at 27.50% per year and has raised distributions for 35 years in a row. YUM has been able to deliver 32.60% dividend growth over the same time frame, but has only raised distributions for eight consecutive years. The latest dividend increases of Yum! Brands however have been much higher than those for McDonald’s. In addition to that, the dividend payout ratio for Yum! Brands is much lower than the payout ratio for McDonald’s (MCD). Investors should also evaluate the risk of dividend cut, particularly if the dividend payout ratio is overextended above 60% for one of the companies. 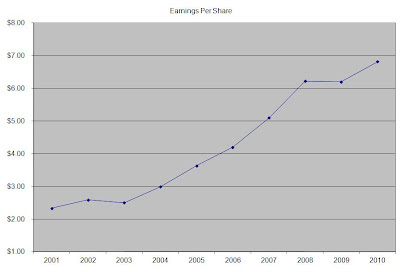 Over the past decade, MCD has managed to increase earnings per share at 20.70% per year. YUM has been able to deliver 13% EPS growth over the same time frame. McDonald’s generates 2.5 times the amount of sales that Yum! generates. In addition to that, the golden arches have a market capitalization that is three times the size of its rival. The future earnings growth, the expectations behind earnings growth are the fundamental factors that are going to drive dividend increases, share price growth over time. No two analysts have the same opinions on who will perform better over the next decade. This is exactly why picking one company over the other is more complicated. I always stress diversification in as many sectors as possible. I also try to be exposed to several issues within a sector, in order to avoid any losses in income or principal stemming from a few bad apples. Investing is all about making assumptions and having a set of estimates of what might happen. Whether your theory materializes or not, is yet to be seen. However, by owning shares in two fast-food companies with global operations, you are better positioned than owning just one fast food company. 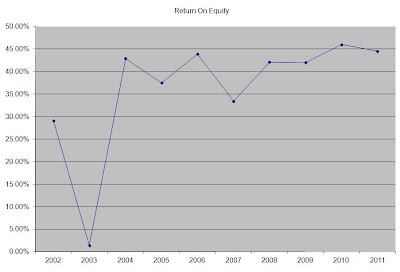 For example, investors who owned Wal-Mart (WMT) over the past decade have seen very little in terms of total returns. On the other hand, investors who owned Target (TGT) shares, did very during the same period. Back in the year 2000, it would have been impossible to determine which of these two companies would have outperformed the other. That’s why having an allocation to both could be a winning strategy after all. In addition, investors who favored British Petroleum (BP) in 2009 over Chevron (CVX) for example, would have been in for a nasty surprise when BP was involved in the Gulf of Mexico oil spill. This resulted in steep declines in the company’s share price, as well as a suspension of its quarterly dividend. For my retirement strategy, I purchase dividend paying stocks with shareholder friendly managements, that can afford to raise dividends every year. I typically tend to focus on companies which have raised annual distributions every year for over one decade. I do however try to analyze the long-term dividend histories of companies I am researching, in order to determine if there are any past events which could forecast trouble for my income stream in the future. Utilities are notorious for raising distributions for one or two decades, before cutting or freezing them for several years. After that, it is pretty easy to start raising distributions again, and the company might even reach dividend achiever status once again, while early investors might be receiving less in distributions than a decade earlier. In my dividend strategy, I try to avoid these cyclical dividend achievers. In order to generate sustainable dividend income, I try to avoid cyclical dividend achiever. For example ONEOK (OKE) cut its dividend payment in 1989 to from 16 cents/share to 7.50 cents/share. The distribution was not restored until 1998. It is normal for a company with a long streak of dividend increases to pause them, and that would make the stock a hold, but would not necessarily mean it is a sell. A large portion of the company’s revenues come from Emerging markets, where sales growth is expected to continue at a high single digit to a low double digit rate of increase. The company has also been able to pass on increases in prices of raw materials onto consumers, who purchase its branded products globally. The risk behind this strategy is if Unilever increases prices to rapidly, sales volumes might suffer as a result. Typically however, while the market for food and personal consumer products is highly competitive, demand is stable and relatively immune from economic stress. The company’s strategic plans have revealed that it expects long-term sales growth of 3%- 5% per year. There are several lists that dividend investors use in order to find investment ideas. The dividend achievers and the dividend champions lists are just two starting points. The lists focus mostly on companies raising distributions for over 10 for the achievers and over 25 years for the champions. There are eleven companies however, which have each managed to increase distributions for over half a century. This is no small accomplishment, given the fact that the past half a century included several recessions, oil price shocks, high inflation and interest rates and several wars. Two other companies which could join the dividend kings list include Coca-Cola (KO) and Johnson & Johnson (JNJ), which have raised distributions for 49 years in a row. Warren Buffett describes the stock market’s short term fluctuations as a voting machine, by tallying up which firms are popular and which are not. However, in the long-term the market is a weighting machine, where the fundamental strength of the companies is being evaluated. What truly matters in the long run is how well will the company execute its long term strategy in order to keep generating the rising earnings to pay higher distributions over time. As a long term investor I keep a close eye on the long-term performance of the companies I own stock in. I do however ignore daily noise about market fluctuations, news about the economy or even the recent news about Europe. I keep focusing on the long term picture and sticking to my retirement strategy of buying dividend stocks with rising distributions. The new year has just began, and there are many analysts making bold predictions. These predictions vary from cautiously optimistic about the markets and the world economy to overly pessimistic about Europe, Financial Crisis and inflation. Unfortunately, I cannot predict the future. I do know however, that investors become successful only after they find a niche that gives them an edge in their quest for long term wealth accumulation. My niche is dividend growth stocks. These companies have managed to boost earnings and dividends for many decades, through recessions, wars, oil embargoes and double digit inflationary periods. The companies I invest in typically provide consumers in every continent with products or services they use on a daily basis. No matter what happens with the economy, people will still do grocery shopping, and spend on basic needs. This makes the business model for most of the stocks I focus on very defensive in its core. Some of the best companies to own in 2012, make great acquisitions that I plan to hold for several decades. I mostly sell only when one of these three events occurs. The one prediction I will make is that the following companies will boost their dividends in 2012, as they have previously done for years before. The following companies should do well no matter what happens with the global economy in 2012. While they are defensive, they also have a growth kick that would enable them to generate the rising earnings stream to pay for the dividend increases in 2012 and beyond. Their diversified income streams, spread out globally, as well as the recurring nature of their products or services make them great long term holdings for any serious dividend investor. With an average yield of % ,and strong expected dividend growth, these stocks are a good list to add to a dividend portfolio. I invest in dividend stocks, in order to generate a sufficient income stream, that would meet and exceed my expenses in retirement. Retirement to me is the point where my dividend income exceeds my expenses, which means that I no longer have to work for money. I am a big proponent of value investing, which is why I would only consider myself financially independent whenever the dividend income stream generated by my portfolio exceeds 1.5 times my annual expenses. In order to get there, there are several simple, but crucial principles I need to follow. The first principle in building wealth through dividend paying stocks is to spend less than what you earn. I have consistently managed to save approximately half of my after-tax income every month. In addition, any bonus or raise received has been designated to my dividend growth portfolio. It also doesn’t hurt to try looking for additional income opportunities, which are dependent on my skillset. By investing as much as possible, I can grow my portfolio and the income stream it produces very quickly. In addition, by spending half of my salary for example and keeping expenses low, I would only need 50% less than what I currently make in terms of dividend income. In addition, regular saving helps me to consistently add to my portfolio. This regular dollar cost averaging over time into positions that are attractively priced, creates another layer of safety. The second principle is to invest your money very conservatively. I invest my money as if I would lose my job and I would have to depend on my portfolio income for my sole purpose of survival. As a result I do not chase hot stocks or try to outsmart the market through frequent trading or market timing. I have designated a simple strategy, which fits my personality and which works for me. Since I have designated the strategy, and since I have had years of experience in the markets, I know when to look for an investment opportunity. I do continuously try to learn as much as possible about markets, investing and other strategies, in order to find ways to improve. While I mostly stick to my strategy, I sometimes do deviate from it. I have purchased companies yielding less than 2.50%, or ones which have had less than 10 years of consistent dividend increases. I have not purchased stocks whose P/E ratio was above 20 times earnings however. Valuation is paramount in my investment decision. I typically expect that the distributions from my dividend portfolio would grow organically by about 6% per year. In comparison, dividends on Dow Jones Industrials Average grew by over 5% per year between 1920 and 2005. The rising dividend stream will maintain purchasing power of my income stream by protecting it from inflation. The types of companies I invest in include such blue chips like Johnson & Johnson (JNJ) or PepsiCo (PEP). The fourth principle involved selling underperforming shares. While I take a great amount of time analyzing companies and making sure they are priced right before I purchase them, I realize that things could change and that I should not be married to a stock that does not deliver results. In a previous article I mentioned that typically sell dividend stocks only after three events have occurred. One of these events includes dividend cuts. If a company whose stock I own lowers or eliminates dividend payment, I immediately sell and reinvest the proceeds into an investment from a similar sector that is priced attractively. For example, when I sold British Petroleum (BP) in 2010, I immediately purchased shares of Royal Dutch Shell (RDS/B). As a result, I was able to replace the dividend income to a certain extent, and still had exposure to the Energy sector. The fifth principle is all about diversification. I try to maintain a diversified income portfolio, which has over 40 individual securities in it. The portfolio is not equally weighted, as it has been built over a long period of time. It includes a fair amount of underweight positions, which were accumulated when they were attractively valued, but are no longer fairly valued. Examples include Family Dollar (FDO) and Yum! Brands (YUM). The reason behind diversification is to ensure that the income stream is not severely affected when one or two of the stocks I own cut distributions. A dividend cut in a portfolio of less than 10 stocks will severely affect the income stream. A dividend cut in a portfolio of over 30 stocks will not affect the dividend income. In an equally weighted portfolio, even if the dividend is completely eliminated in one or two components, the total income can still grow if the other components grow distributions and if the sold stocks are replaced strategically. The sixth principle of my wealth accumulation strategy is strategically reinvesting dividends. While I plan that my dividend growth portfolio will generate organic dividend growth of 6% per year, by reinvesting dividends, I can generate a much higher total growth in portfolio distribution income over time. Basically I am turbocharging my total dividend income by purchasing shares which rise dividend payments, then reinvesting these dividend payments and also adding new capital to the portfolio every single month. I typically wait for the amount of dividends and the amount of new capital to reach $1000 before I purchase a new or additional position in a given company. I do not automatically reinvest dividends, because I do not want to purchase additional shares in a company that overvalued. In summary, by saving money, investing them in blue chip dividend growth stocks and reinvesting dividends and new capital, I plan to generate enough dividends to make me financially independent. I follow the six principles in my wealth accumulation and dividend income generation. My dividend income is getting closer to 40% - 45% of my expenses, after following these guidelines for a several years. In a few short years, my dividend income should be able to exceed my monthly expenses, without having to endure a lower standard of living. I recently read an article titled “ Are we Witnessing a Dividend Bubble?”. While catchy titles like Dividend Bubbles and comparisons to the Nifty Fifty from the 1970's can attract readers, there is little substantive evidence to prove that we are in an actual dividend bubble. Back in 2008 I myself wrote an article where I predicted that record low interest rates might lead to a Dividend Bubble. The Nifty Fifty was a group of one decision growth stocks, which money managers bought indiscriminately regardless of valuation. When the US economy entered a recession in 1973, the rosy earnings expectations for the high multiple Nifty Fifty turned gloomy. As a result, share prices fell sharply. The contraction was more severe for the Nifty Fifty stocks, many of which did not return to their highest stock price levels for many years. Dividend stocks are a buy and hold for the long term type investment. Making an assumption about “dividend bubbles” based on relative outperformance in a period of less than one year does not sound convincing. While the Nifty Fifty were also considered a buy and hold type of stocks in the 1970's, the major difference is that dividend stocks are actually undervalued. In addition, few investors actually appreciate the value that dividend stocks offer to investors. Bubbles are characterized by irrational exuberance and chasing of assets regardless of their underlying fundamentals. Given the fact that only few investors appear optimistic about dividend stocks, and that fundamentals appear sound, it is premature to talk about a bubble in dividend stocks. Given the low interest rates on US Treasuries and Certificates of Deposit (CDs), many market pundits are claiming that investors are purchasing income stocks in an effort to get higher yields on their nest eggs. These investors are supposed to be least sophisticated, and therefore these market pundits are claiming that the “smart money” should do the opposite by ignoring income stocks. While this could be true in some isolated instances, few investors typically hold large amounts of cash in fixed income instruments. Their assets are typically invested in stock and bond mutual funds. In addition, few investors simply purchase income stocks without doing any research. Given the fact that dividend stocks in general offer greater possibility for higher returns in comparison to fixed income, investors who are selling bonds and buying income stocks might be actually doing the right thing for their money. The only scenario where investors who purchase 10 or 30 year US Treasuries will generate a higher return than stocks will be if we have a Japan style deflation for the next two decades. In my investing, I screen the dividend champions and dividend achievers lists for bargains several times a month. There are usually some overpriced stocks, many fairly priced stocks and a few that are undervalued. On average however, most dividend stocks exhibit similar characteristics to equities in general. Equities are trading at their lowest valuations in many years. Corporate balance sheets are flush with cash, and corporations are earning record amounts. As a result M&A activity is increasing, as are dividends and share buybacks. Dividend investors typically apply a set of qualitative and quantitative criteria, before committing any funds to investments. As a result, even if a company like PepsiCo (PEP) has a wide-moat and will probably keep raising distributions for the next few decades, it should not be bought when P/E is over 20. In conclusion, while it might seem that investors are paying more attention to dividend stocks, this has not led to any overvaluation in stock prices. On the contrary, many dividend paying corporations are flush with cash, and can afford paying higher distributions in the future. Most of these dividend stocks are attractively priced at the moment and offer a better risk/reward than fixed income securities. Given this information, there is no evidence to suggest that we are in a Dividend Bubble. Back in September 2011, I was invited to participate in the Dividend Growth Portfolio project. This project combines the best stock picks from several bloggers that focus exclusively on dividend stocks. The complete portfolio could be seen from this page. Each blogger selected three stocks that they viewed as attractively priced. I selected McDonal's (MCD), Chevron (CVX) and Enterprise Product Partners (EPD). You could read more about the reasoning behind these selections in this article. The rest of the selections can be seen from the table below. Prices were depressed in late September, which is why this portfolio is making money right now. The Procter & Gamble Company (PG) provides consumer packaged goods in the United States and internationally. This dividend aristocrat has raised distributions for 55 years in a row. Over the past decade, Procter & Gamble has managed to boost dividends by 10.90% per year. Analysts are expecting further increases in EPS over the next two years to $4.57/share, which represents a 16.30% expected growth. The stocks yields 3.20% and is attractively valued at the moment. Check my analysis of the stock. Johnson & Johnson (JNJ) engages in the research and development, manufacture, and sale of various products in the health care field worldwide. The company operates in three segments: Consumer, Pharmaceutical, and Medical Devices and Diagnostics. This dividend aristocrat has raised distributions for 49 years in a row. There are only eleven companies in the world, which have managed to accomplish this task. Over the past decade, Johnson & Johnson has managed to boost dividends by 13% per year. Analysts are expecting further increases in EPS over the next two years to $5.24/share. The stocks yields 3.50% and is attractively valued at the moment. Check my analysis of the stock. Philip Morris International Inc. (PM), through its subsidiaries, manufactures and sells cigarettes and other tobacco products. The company was spun off from Altria Group (MO) in 2008, and has continued its predecessor’s tradition of raising dividends every year ever since. I like the company’s strong presence outside the US, and the fact that it has the ability to grow through acquisitions as well as by capitalizing on the rising populations in the emerging markets. Analysts are expecting further increases in EPS over the next two years to $5.21/share.The stock yields 3.90%. Check my analysis of Phillip Morris International. PepsiCo, Inc. (PEP) engages in the manufacture, marketing, and sale of foods, snacks, and carbonated and non-carbonated beverages worldwide. This dividend aristocrat has raised distributions for 39 years in a row. Over the past decade, PepsiCo has managed to boost dividends by 13% per year. Analysts are expecting further increases in EPS over the next two years to $4.66/share. The stocks yields 3.10% and is more attractively valued at the moment relative to arch rival Coca Cola (KO). Check my analysis of PepsiCo. Overall the four picks delivered a total return of 15.40% in 2011. In comparison, the S&P 500 returned 1.90% in 2011, all of which was due to dividends. I believe that the stocks I selected to be great long-term holdings for many decades to come. The companies identified above are riding multi-decade consumer trends, and have strong brands that customers are willing to pay a premium for. In addition, the products that these companies produce would likely still be purchased by consumers for several decades into the future. Rapid shifts in consumer preferences are unlikely. In other words, if you like drinking Pepsi, you would keep drinking Pepsi. As a result, I would consider these stocks to also be the best dividend stocks for 2012 as well. Overall, I have performed very well in this competition, where I participated in 2009, 2010 and 2011. My total returns for 2009 were 26.48% and 26.08% for 2010. In comparison, S&P 500 delivered total returns of 26.35% in 2009 and 14.60% in 2010. In essence, the four picks I selected in each of the three years have outperformed the S&P 500. Whether the four picks outlined in this article outperform in 2012 is yet to be determined. Stay tuned for my next update in early April 2012.